As announced a few weeks ago, PimpsPromo.com is now a corporate sponsor of ASACP. 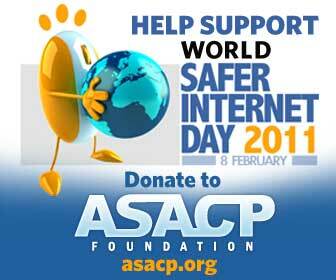 As such, I will be notifying you of special events targeting a safer Internet for children. You may also notice that I will encourage you to either join ASACP or at least donate a few dollars if you believe in the cause of keeping the Internet safe for children. That being said, on February 8, 2011 the ASACP Foundation is holding an online fundraiser in an effort to gather donations to enable them to continue its online child protection mission. These donations help the ASACP develop the RTA labeling and filtering software to work with applications for such mobile devices as the Android. I was trying to remember the last time I attended AVN’s Adult Entertainment Expo (AEE). It must have been six or seven years ago. It was back when AEE and Internext were held at the same time. I remember wanting to get out of the AEE fan show as quickly as possible because it was so crowded. This year, AEE was broken up into a trade show and the fan show. While they did overlap their dates a little, it seemed that it was a lot less crowded. Since it had been so long since the last time I attended AEE I will not bother doing comparisons to previous years, as the economy is a lot different now, so it would be like comparing apples to oranges. The AEE show was held January 6-9 with Internext overlapping it slightly, being held January 8-10. I know it is only January, but the month is almost over and February is a short month, so it is not too early to start making plans for the upcoming Phoenix Forum and Gay Phoenix Forum. This year, the event has been moved up a little and will be held on March 31 through April 2, 2011. The primary reason you will want to register early is because rooms will go on sale tomorrow, Tuesday, January 25, 2011. You can not reserve a room unless you are already registered for the show. This is one of the premiere adult B-to-B trade shows, and should not be missed. This will be the 12th annual Phoenix Forum and the seventh year that the Tempe Palms has been blocked off for the show. A quick glance at the schedule shows that the days will be packed with networking and educational opportunities. Of course, the ever popular snack shack is back, as well as the barbecue and hosted buffet lunches. For the golfers, the seventh annual golf tournament is scheduled for March 30. Registration rates are currently $195 per person, until February 4. On February 5, the rates go up to $275 per person. Onsite registration is $325 per person. Since TPF realizes the importance of having eye candy around the pool, sponsors will be given an allotment of free talent badges and will be given a code to pre-register their models online. Non-sponsors can get discounted tickets onsite for models and talent at $50/day or $75 for a three day pass. Please visit the Phoenix Forum registration page for more details. You can see the photos, videos and reviews from past shows in my archive. Do not forget, rooms become available tomorrow, January 25, 2011 at 9:00 AM MST. I only ask that you call after I get my room. See you there.